The phrase “May you live in interesting times” references a Chinese curse. According to Jewish tradition, such a phrase could be seen as a blessing. It is normal to question why people suffer through challenges - both large and small - but Judaism views these tests, known as nisyonot, as opportunities that God provides each individual to grow and meet his/her true potential. This Treat was last posted on July 3, 2012. Embrace challenges and use them for personal growth. If your second thought (after “hot”) when someone says Miami is “lots of Jews,” then you might be surprised to learn that in the not-so-distant past, the city was not always welcoming to Jews. Until 1763, Florida was Spanish territory, and entry to Miami to practicing Jews was thus forbidden because of the Inquisition. While Jews did slowly settle in other areas of Florida, the first Jew to settle permanently in the Miami area is believed to have been Isador Cohen, who arrived in February 1896. Quickly successful in his mercantile efforts, Cohen was actually one of the signatories of the city’s charter, which was signed on July 28, 1896. He also helped organize Miami’s first congregation which was called B’nai Zion (in honor of benefactor Morris Zion). In 1913, a bridge was built between the mainland and the island that is now Miami Beach and South Beach. Choice beach-front real estate was available for development, but developers prohibited the sale of land to non-Caucasians and anyone of “Hebrew or Syrian” origin. The only exception was at the southern end of Miami Beach, south of Fifth Street. In 1921, the Nemo opened. It was the city’s first kosher hotel. As development boomed, the area attracted top architects who created the unique nautical art deco designs, many of which have been preserved to this day. While Jews slowly gained more access to Miami property as land changed hands and the initial restrictive clauses were forgotten, it was not until 1949 that the Florida legislature made it illegal for real estate companies and hotels to discriminate. In addition to tourists who were entranced by the surf and sun and chose to relocate, and the retirees who made their winter plans permanent, Miami also attracted a large number of Jewish servicemen who had been stationed there during World War II. Miami became home to a large population of Cuban Jews as well, who left their homes when Fidel Castro assumed control in 1960. It would be nice if we lived in a world where everyone was honest. Unfortunately, the news is full of stories of dishonesty, and phone scammers and identity thieves abound. The fact that people might be dishonest, however, does not absolve one of the obligation to give charity and help those in need. There is an interesting narrative included in the Talmud (Ketubot 67b/68a) that provides insight into how to handle a situation in which one discovers, after the fact, that the charity they had given went to tricksters. Rabbi Chanina sent four zuz to a poor man every Friday. One week, when his wife went to deliver the money, she overheard the so-called “poor man” being asked by his servants if he wished to dine on the silver cloth or the gold cloth. One aspect of the mitzvah of giving charity is a recognition that everything one has comes from a Greater Source. By assisting others, one recognizes God’s generosity and emulates His ways. The Talmud does not explain what Rabbi Chanina decided to do after he learned of the man’s lack of need, but one can assume by his response to his wife that he remained calm, even if he eventually confronted the man. The onus of the deception was on the “poor man” and not on Rabbi Chanina, who did nothing wrong and had only the proper intent. In order to protect those who want to give, many communities have created organizations that distribute funds after performing background checks or who issue certificates validating that the person seeking charity is legitimate. When giving charity directly, do so with a smile and a kind word. The story of the Jewish Disabilities Act (disabilities referring to restriction on civil rights) is a tale of political perseverance. The first Jewish Disabilities Act was introduced to Parliament in 1830 - one year after the passing of the Roman Catholic Relief Act - but failed to be passed on four different occasions before it was set aside in 1836. In 1847, Baron Rothschild, who was active in Liberal party causes, agreed to stand for Parliament for the City of London. As soon as he was elected, Lord John Russell, head of the Liberal party and Prime Minster, introduced a new Jewish Disabilities Act. It passed the House of Commons but failed in the House of Lords in both 1848 and 1849. Baron Rothschild ran again, and won, in 1849. In 1850, at the prompting of several electors, Baron Rothschild entered the House of Commons, but when he demanded an Old Testament on which to take the oath, he was called upon to withdraw. The same thing happened when he refused to say the Christian clause. The pattern continued. A bill was introduced and defeated in 1851, 1853, 1854, 1856 and 1857, and Baron Rothschild continued to be reelected. In 1857, it was decided that each House of Parliament would make their own decision. Thus it was that Baron Lionel Nathan de Rothschild became the first practicing Jew in the House of Commons. In 1885, his son, Nathan Mayer Rothschild became the first Jewish member of the House of Lords. Do not be ashamed to stand up for your beliefs. In his youth, Imri "Imi" Lichtenfeld (1910 - 1998) was a successful boxer, wrestler, gymnast and all-around athlete. He had inherited his physical prowess from his father, Samuel, a former circus acrobat who was a chief inspector of the Bratislava (Slovakia) police force and the owner of the Hercules Gymnasium, where Imri trained. As much as Lichtenfeld enjoyed his competitive athletics, he was forced to face the brutal realization that fighting skills honed in an arena provide one with little protection when involved in a real fight. This fact was driven home by the increasing anti-Semitic violence of the 1930s in Slovakia. Riots broke out, and Lichtenfeld found himself leading a self-defense squad made up of young athletes. It was both a humbling and motivating experience. As the Nazi conquest of Europe progressed, Lichtenfeld headed for British Mandate Palestine, which he had visited once before for the 1935 Maccabia Games. The Aliyah Bet riverboat (the Pentcho) on which he traveled was shipwrecked on the Greek Dodecanese Islands. Instead of going to Palestine, Lichtenfeld fought in North Africa with the Free Czech Legion and only reached Palestine in 1944. Throughout these years, Lichtenfeld had been developing his unique self-defense martial arts known as Krav Maga (literally "fight contact"). In Palestine, he immediately began training elite units in the Hagana and Palmach. In 1948, after the creation of the state of Israel, Lichtenfeld was named Chief Instructor for Physical Fitness and Krav Maga. For 20 years he taught the young soldiers of Israel. When he retired in 1964, he developed a civilian version of Krav Maga. While Krav Maga is considered a martial art, it is taught on different levels - more and less dangerous. One can easily kill with Krav Maga, but that is against the nature of the art. Lichtenfeld's primary goal was extreme self defense, to allow one who is attacked to disable his assailant as quickly and as efficiently as possible. Imri Lichtenfeld passed away on January 9, 1998. Ever since Moses saw the Israelites dancing around the Golden Calf and smashed the two tablets of the law, the 17th of Tammuz has been an inauspicious day for the Jewish people, a day on which numerous tragedies occurred. One of the famous tragic events of the 17th of Tammuz was the placing of an idol in the Temple. There are different opinions about exactly when this incident occurred. One view in the Talmud (Ta'anit 28b) says: “An idol was placed in the Temple. From where do we know this? -- It is written, ‘And from the time that the daily sacrifice shall be taken away and the abomination [idol] that causes desolation set up’(Daniel 12,11).” The daily sacrifice was abolished on the 17th of Tammuz and, therefore, the idol was placed in the Temple on that very same day (during the Babylonian siege). Others believe that the incident refers to an act done by Apostamos, a Greek who was also responsible for burning the Torah (during the Second Temple period). Manasseh was twelve years old when he began to reign... And he set the graven image of Asherah, that he had made, in the house of which God said to David and to Solomon his son: "In this house, and in Jerusalem, which I have chosen out of all the tribes of Israel, will I put My name forever...'' (Kings II 21:1-7). While a Greek placing an idol in the Temple was, indeed, terrible, a Jewish king doing so was a much greater tragedy. This Treat was last posted on July 15, 2014. In truth, however, this period of "sadness" begins on the Fast of the 17th of Tammuz (observed today) and lasts exactly three weeks - untilTisha B’Av (the Ninth of Av), the day on which we mourn the destruction of both the First and Second Temples. This Treat was previously posted on July 5, 2015. If you are observing the Fast of the 17th of Tammuz today, take it easy and stay where it is cool. 3. The walls of Jerusalem were breached leading to the destruction of the First (actually occurred on the 9th of Tammuz) and Second Temples. Based on the biblical verses found in Zachariah, Chapters 7 and 8, it is our practice to fast from dawn to nightfall. This Treat was last posted on July 5, 2015. This Treat was last posted on July 14, 2014. 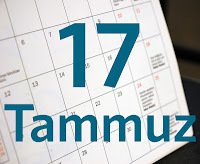 Prepare for the fast of the Seventeenth of Tammuz, which begins at sunrise on Sunday, by drinking extra water ovr the next two days. Among the many prophets who predicted the destruction of Jerusalem, only one prophetess is recorded. Huldah was a descendent of Joshua and Rachav, as well as a cousin of the prophet Jeremiah and the wife of Shallum ben Tikvah, who was part of the King Josiah’s household. According to the commentaries, Huldah ran her own school for women, which, it has been suggested, was located at the southern gates of the Temple (now referred to as Huldah’s Gates). The Midrash Yalkut Shimoni notes that while Jeremiah prophesied in the marketplace and the prophet Zephaniah preached in the synagogues, Huldah spoke to the women. “Thus says the Lord, the God of Israel: Tell the man that sent you to me: Thus says the Lord: Behold, I will bring evil upon this place, and upon its inhabitants, even all the words of the book which the king of Judah has read; because they have forsaken Me, and have offered to other gods, that they might provoke Me with all the work of their hands; therefore My wrath shall be kindled against this place, and it shall not be quenched” (II Kings 22:15-17). As a result of Huldah’s prophecy, Josiah summoned the people and persuaded them to repent. Huldah thus played an important role in the fateful return and repentance of the people to their traditions and faith. God also acknowledged Josiah’s own piety and promised that none of this would come to pass while he was still alive. Speak the truth, but gently in difficult situations. Every therapist emphasizes the importance of good communication. It sounds easy, but it isn’t always. Hearing what one wants to hear and ignoring the inflection and subtext, often leads to unexpected and dramatic turns of events. Few places in the Torah better demonstrate this than the events leading up to Balaam’s curses that were turned into blessings. Balaam the son of Beor had the special ability to communicate with God. When he was approached by a delegation sent by Balak, King of Moab and asked to curse the Children of Israel, he bade the men wait one night while he consulted with the Divine. God told him: “You shall not go with them! You shall not curse the people [of Israel] because they are blessed” (Numbers 22:12). Balaam sent the messengers away, but Balak sent another delegation. Balaam, who very much wanted to fulfill Balak’s request, returned to God and this time was told: “If these men have come to call for you, arise and go with them, BUT the word I speak to you-that you shall do" (22:20). On the surface, God appears to approve of Balaam’s going. But, when he got up early in the morning to saddle his donkey for the journey, “God’s wrath flared because he was going...”(22:22). God’s anger hinged on the word “but.” According to the commentary of Rashi, the “but” was a warning that the mission was not the right choice. Furthermore, according to Rashi, Balaam chose to go because he felt certain that he could eventually persuade God to allow him to curse the Israelites. Make an effort to be an active listener. Given Turkey’s proximity to the Land of Israel, it is not surprising that there has been a Jewish presence in that country since at least the 4th century B.C.E, when the land was Roman territory. When Rome fell, Turkey became part of the Byzantine Empire, whose capital was Constantinople (present day Istanbul). In 1453, the Ottoman Empire arose out of Turkey and remained the controlling power of the area until World War I. During the Byzantine era, the Jews faced similar persecutions in Turkey as the Jews did in the Christianized Roman Empire and Medieval Europe. They were taxed, expelled and sometimes faced violence. Although there were times of persecution, the Ottoman’s were generally quite welcoming to the Jews who fled there, after being expelled from Hungary, France, Bavaria, and more. The most significant of these waves of Jewish immigration occurred in 1492, when the Jews were forced out of Spain. While Jews were not equal citizens to Muslims, they were allowed to live as semi-autonomous communities and most of the persecution they faced was directed at all non-Muslims, not just the Jews. Following World War I, the Ottoman Empire was occupied and divided by the Allied victors. By the early 1920s, the Turks were fighting for independence and the “Republic of Turkey” was proclaimed on October 29, 1923. The severe change in Turkish life, from theocratic sultancy to secular republic was challenging for the citizenry, and there was an increase in anti-Semitism (see The Thrace Pogroms). And while the country was now secular, distinctions remained between Muslims and non-Muslims. In 1942, a special tax (179% for Jews), the Varlik Vergisi, was imposed on non-Muslims, encouraging many Jews to leave the country. Between 1948 and 1951, tens of thousands of Turkish Jews moved to Israel. Today, most Jews living in Turkey reside in stanbul. While there has been increasing anti-Semitism, there have also been generous overtures of friendship to the community, such as the rebuilding of the Great Synagogue in Edirne, where the first Jewish wedding in over 40 years recently took place. Don't hesitate to ask God for the things you want as well as the things you need. According to a hand written document shared by the Soviet Union in 1957, Raoul Wallenberg died of heart problems in his cell on July 17, 1947. By the time the document was released, both the head of the prison who had written the note, and the man to whom it had been sent were no longer alive, thus no one could refute its origin. Why Wallenberg was in a Soviet jail in the first place, remains as much conjecture today as it did then. Let us not, however, allow the mystery of Wallenberg’s fate overshadow the heroism of his life. Born in August 1912, Wallenberg was the son of one of Sweden’s most prominent families. With a penchant for languages and an architectual degree from the University of Michigan, Wallenberg ended up doing business in South Africa and then Haifa, before returning to Europe in 1936. Wallenberg became the business associate of a Hungarian Jew, Kalman Lauer, and frequently traveled to Budapest for him to check on business and his family. In 1944, the American War Refugee Board sought to create a rescue mission for Hungarian Jews from the neutral country of Sweden. Wallenberg was asked to take the lead. He arrived in Budapest in July 1944 and immediately set to work establishing an embassy office near the ghetto and employing hundreds of Jews. Working outside almost all normal channels, Wallenberg dedicated himself to saving lives. He handed out schutzpasses, written out passports that offered Swedish protection - for which he initially only had permission to write 1,500. He bought or rented apartments from which he flew Swedish flags, thus making them extensions of the embassy and neutral territory where Jews could be protected. He convinced the Nazi commander not to blow up the ghetto by threatening to charge him with war crimes (the Nazis were already losing). Wallenberg was so dedicated to his work that he was known for walking into the heart of Nazi operations - even boarding deportation trains - and handing out schutzpasses in front of the Nazis and then insisting that those with passes be permitted to leave the train. In January 1945, as the Soviets conquered Hungary, Wallenberg and his driver Vilmos Langfelder left Budapest to go to the Soviet encampment at Debrecen. Neither were ever seen again, although for years after his supposed death, released Soviet prisoners described seeing him in jails and hospitals in the Soviet system. Raoul Wallenberg’s true fate may never be known, but his unparalleled heroism has been universally acknowledged. When you learn about someone acting heroically, don't hesitate to talk about it with friends and family. Use the relaxing atmosphere of Shabbat to mediate on all that you have to be grateful for. At what temperature does water begin to cook? According to Jewish tradition, that temperature is known as yad soledet bo, hot enough that “one pulls one’s hand away.” It was an extremely practical measurement statement for a time when there were no thermometers. Defining yad soledet bo, however, is important because it affects both the laws of kashrut (dietary) and the laws of Shabbat. In the realm of kashrut, yad soledet bo is significant because it is at this temperature that a liquid, a food item or a utensil used for food preparation begins to transfer its “flavor.” Since no transference takes place in cold mixtures, a cold dairy spoon placed in cold leftover chicken soup will not be affected in the same way as a cold dairy spoon placed in a hot chicken soup or a hot spoon placed in a cold chicken soup (or hot into hot). – Please note that there are other ways that “flavor” can be transferred (be careful with pungent or spicy foods and sauces!). On Shabbat, recognizing the temperature of yad soledet bo is important because of the prohibition of cooking on Shabbat. While one may place a liquidy food near a source of heat to take off the chill or warm it to room temperature, causing it to reach yad soledet bo would be considered cooking. – Again, please note that this is a simplified summary. Because of the significance of yad soledet bo, rabbis have continually attempted to define it, especially as the need to withdraw one’s hand is extremely subjective. The Talmud (Shabbat 40b) defined it as being hot enough to scald the skin of a baby’s abdomen. Later sages, having ways to actually measure temperature, have expressed a range of opinions from 110 degrees (43 Celsius) to 160 degrees (71 C). The wide range of definition allows one to be stringent in both how hot a cold item becomes or how low the temperature on an item that was yad soledet bo must be to be considered to have cooled off. Pay attention to hot items in the kitchen, both for safety and for kashrut. Diplomat, writer and politician, Moshe Sharett (originally Shertok), the second Prime Minister of Israel, moved with his family to British Mandate Palestine from the Ukraine in 1908, when he was 12 years old. After a brief stay in a small Arab village, the Sharetts moved to Jaffa and became one of the founding families of the city of Tel Aviv. Sharett graduated from Herzliya Gymnasium, the first Hebrew language high school in Palestine. When Sharett’s law studies in Istanbul were interrupted by World War I, he served in the Turkish army as a translator. Returning home after the war, Sharett began his career working for some of the organizations that would eventually form the government of the State of Israel. Sharett studied at the London School of Economics (1922 - 1924), after which he assumed the editorship of several Zionist publications. At the outbreak of World War II, Sharett helped establish the British Army’s Jewish Brigade, which had an essential secondary mission of helping European Jews immigrate to Palestine. Sharett was at the United Nations when the UN member nations voted in favor of partitioning the British Mandate of Palestine in 1947, and he signed Israel’s Declaration of Independence in May 1948. Serving as Israel’s first Foreign Minister, Sharett not only set up the foreign affairs office, but dealt with cease-fire negotiations and arranging Holocaust reparations from Germany. In 1954, when Ben-Gurion retired, Sharett, as head of the Mapai party, became Prime Minister and served for a little under two years. It was a trying time of increasing tension, particularly with Egypt, and Sharett, who favored negotiations over action, was at odds with the other leaders of his party. Ben-Gurion came out of retirement at the end of 1955 and returned to serve as Prime Minister. Sharett remained as Foreign Minister for six months before leaving government. During his retirement, he became the head of the Am Oved (“Working Nation”) publishing house, the chairman of the Beit Berl College and chairman of the World Zionist Organization and the Jewish Agency. Moshe Sharett passed away at the age of 70 on 7 Tammuz in 1965. Strive to be the person who is known to work well with everyone. This Treat was last posted on February 18, 2009. Wash and dry your produce before eating. If you follow Jewish news, it would be hard not to notice the growing number of reports about increasing anti-Semitism. It is an upsetting fact that anti-Semitism has never really had a rational source, although many reasons are given. Researching the history of anti-Semitism, it is not uncommon to find instances where Jews have bent over backward to accommodate others, in order to prove that they are no threat. But these efforts have rarely made a difference. It is interesting to note that even that pattern of attempting to assuage their enemies has a biblical parallel. As the Israelites approached the Promised Land, they sought passage through the land of Edom. Before entering the kingdom, Moses sent messengers who first identified the Israelites as the nation brought out of servitude by God and then made their specific request. “Let us pass, please, through your land. We will not pass through field or through vineyard, neither will we drink of the water of the wells. We will go along the king’s highway, we will not turn aside to the right or to the left, until we have passed your border (20:17). Edom said no, threatening the Israelites with the sword even when the Israelites offered payment. Refused passage, the Israelites changed course until they came to the border of the Amorite kingdom and sent a similar message to their king, Sichon. Rather than just say no, Sichon gathered his armies at the border where the Israelites were camped. The Israelites made no threats and asked for no favors. They wanted only to pass without harm, yet they were cast back into the wilderness and attacked. Through it all, despite their enemies irrational focus and hatred in generation after generation, the Children of Israel not only survive, but are victorious, because God is always there to help. Try to help others when they ask for your assistance. When Benjamin Cardozo (May 24, 1870 - July 9, 1938) was nominated to the United States Supreme Court, the New York Times felt it newsworthy to note the rarity of having a nominee so universally approved. In fact, Cardozo was a Democrat appointed by a Republican President. Most importantly, he was a man who demonstrated great care with the law. Cardozo, who was one of six children, chose a career in law even though his own father, Albert, had been forced to resign from the bench due to a political association with Tammany Hall. Noted for his bright mind, Cardozo entered Columbia University at the age of 15 and stayed there through law school. He immediately entered his father’s law firm and quickly made a name for himself in commercial law. In 1913, he was elected to the New York Supreme Court, where he sat only briefly as he was chosen shortly thereafter to join the New York Court of Appeals as Chief Judge. Cardozo’s Supreme Court nomination came in 1932. He was unanimously approved and served until his death six years later. Cardozo was the second Jew appointed to the Supreme Court, and served alongside his co-religionist Louis Brandeis. While not particularly observant, he was highly involved in Jewish causes and philanthropic endeavors. He was a member of the Judean Club and served on the board of the American Jewish Committee. Cardozo had mixed feelings about the emerging Zionist movement, but eventually agreed to join the Zionist Organization of America because to not do so would appear as if he opposed the movement. Cardozo had deep roots in American Jewish history. His maternal great-grandfather, Benjamin Mendes Seixas, was one of the founders of the New York Stock Exchange, and he was a cousin of Emma Lazarus. He was a life-long member of New York’s Congregation Shearith Israel. If the weather is nice, take a relaxing Shabbat walk with a friend or family member. How does a Jewish Treat become a chocolate treat? When the topic of the day is about the Jewish connection to the early trade of chocolate, we find the perfect reason to feature a Treat in honor of World Chocolate Day (July 7). Having been expelled from the Iberian Peninsula in the 1490s, professing Jews were not part of the Spanish conquest of Central and South America. However, many conversos (hidden Jews) traveled to the new colonies in the hope that they would eventually be able to live openly as Jews. Once there, the conversos became deeply involved in cross-Atlantic commerce, including the cocoa trade. By the 1600s, cocoa was a much sought-after commodity, and Benjamin de Acosta d’Andrade, took chocolate to the next level. A native of Portugal who had emigrated to Brazil and reclaimed his Judaism, de Acosta established a cocoa plantation on the French Island of Martinique. He is credited with modernizing the cocoa process and creating chocolate. As chocolate’s popularity grew, numerous other Jews became involved in its growing, processing and trading. Alas, this came to an abrupt end when, in 1685, King Louis XIV issued the Code Noir, which, among other things, ordered all Jews out of the French colonies. Jews were also involved in the chocolate trade in Europe. The port city of Bayonne, located in the Bay of Bisque just over the border from Spain, has a renowned history of chocolate production. While no Jews were allowed to live in Bayonne, there was a thriving converso community in the neighboring borough of St. Espirit. It is believed that these conversos brought the secrets of great chocolate production with them from Spain and Portugal and were the original source responsible for the exalted reputation of Bayonne’s chocolate. It is interesting, but not surprising, to note that in 1681, the Bayonne chocolate guild passed an ordinance forbidding the retail of Jewish chocolate in the city. Try some of the many choices of kosher chocolate that's available. Rabbi Moses Maimonides (Rambam) writes that when a person becomes angry, it is regarded as if he had worshiped idols and that Gehenna (where souls are purified) will have dominion over him. But anger is a natural emotion, so how can the Rambam condemn a person for a such a natural reaction? Idol worship attributes the power to control the world to someone or something other than God. When a person gets angry, he or she transforms themselves into an idol by assuming that they are in control of everything. Why do we get angry? Because someone said something wrong to us or something didn’t turn out the way we had hoped. When people get angry because they did not get the bonus they had expected, they, in fact, assume that they know and understand all of the factors that go into determining the company’s policy regarding bonuses. The Rambam’s second point, that Gehenna will have dominion over an angry person, is actually quite understandable to anyone who has felt intense anger. “Blood-boiling” is the description ascribed to the physical reaction of our bodies to our emotion of anger. The point of anger at which one assumes a level of all-knowingness and is brought to physical discomfort is extreme. And yet, each time one gets extremely angry, it makes it easier to happen again. The antidote to extreme anger is humility, to know our limitations and to recognize the potential good in others. A dose of humility keeps one from anger, thus maintaining a person’s understanding of who is the true King of the World. This Treat was last posted on January 6, 2009. If there is a situation in which you consistently lose your temper, rehearse ways to avoid getting angry in that situation. Try to look at different commentaries to understand any questions you have on Jewish texts. At the time of the American Revolution, approximately 2,000 Jews resided in the colonies. A fair number of these Jews served in the Continental Army, and many others showed their patriotic fervor by raising funds and supplying the troops. Today’s Independence Day Jewish Treat takes a look at two Jewish doctors who joined the Continental cause. Dr. John de Sequeyra did not serve in the army because he was 58 years old when the War of Independence began. As a resident of Williamsburg, Virginia, however, he was fairly well-connected to several of the nation’s Founding Fathers. For instance, in 1769, Dr. de Sequeyra treated Martha “Patsy” Park Curtis, George Washington’s step-daughter, for epilepsy. Dr. de Sequeyra was also credited by Thomas Jefferson for introducing the edibility of the tomato to the colonists. Born in London (1719), Dr. de Sequeyra studied medicine at the University of Leiden (Holland). He came to Virginia in 1745 and immediately began practicing. His extensive patient notes, published as “Notes on Diseases in Virginia,” were recorded from 1745 until 1781. From 1773 until 1795, he was the visiting physician at the Public Hospital for the Insane (now Eastern State Hospital) located in Williamsburg. Whereas Dr. de Sequeyra was a university trained physician, “Dr.” Phillip Moses Russell earned his title on the battlefield. A native of England who immigrated to Pennsylvania, Russell served as a surgeon’s mate and then as an assistant under-surgeon at Valley Forge. Under the most trying conditions, Russell treated soldiers ravaged by disease and exposure to the harsh elements. Eventually, he himself contracted camp fever, which affected his hearing and sight enough that he had to resign his commission in 1780. Before leaving the army, Russell, along with six other Jews, served as a guide during the colonial army’s unsuccessful attempt to retake Savannah, Georgia. After the war, Russell resided in Philadelphia, married and raised ten children. He passed away in 1830. Express your thanks for living in a land of freedom. Call any friends or family in Canada and wish them a Shabbat Shalom.